In my opinion, Windows XP was developed with a very useful feature called Hibernation. What it does is that it allows you to shutdown the computer without closing your applications, thus saving your work. The next time you boot up your computer, all your previous work will be loaded up automatically. On the downside though, Hibernation doesn’t come cheap — it requires at least 512MB depending on your system. It took up more than 1GB on my Acer notebook. How to find out if Hibernation is enabled on your computer? Just click on the Start button and select Turn off computer. Hold down the Shift button and see if the Standby icon changes to Hibernate. If it does, Hibernation mode is enabled. If Hibernation is on, you can disable it by going into the Control Panel and clicking on the Power Options icon. Click on the Hibernate tab. Uncheck the Enable hibernation checkbox and click OK.
System restore is another feature of Windows that helps you restore your computer in case your system is down due to file corrupted or system misconfiguration. Just like the Hibernation feature, system restore does take up space on all your drives. In fact, it can be much worse because it takes up 12% of your disk space by default. 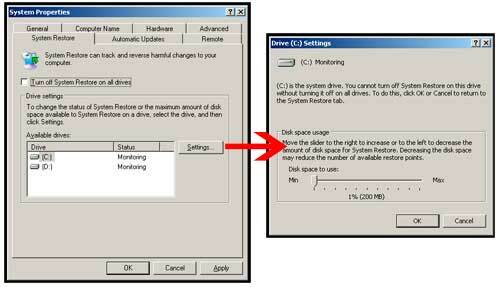 To save up space in C drive, you can either disable system restore or reduce the disk space usage allocated for it. To do so, open up Control Panel and click on System. Then, click on the System Restore tab. If you want to disable system restore, just uncheck the Turn off System Restore on all drives. I do not recommend this though. It is best to reduce the size instead. Click on the C drive in the list and then click on the Settings button. You can reduce the space allocated for system restore by sliding the slider to the left and click OK.
3. Delete old temp files in Local Settings\Temp. This step is probably one of the most effective steps in helping you recover the most hard disk space. I was able to free up 3GB just by deleting the files contained in this folder. The location of this directory may vary on different operating systems. Assuming you are using Windows XP, go to the folder C:\Documents and Settings. Double click on the folder where its name is your Username account. Double click on the Local Settings folder. Once in that folder, double click on the Temp folder. Delete all files in the temp folder. In my case, the location of this temp folder is at C:\Documents and Settings\Kelwin\Local Settings\Temp. If you cannot find the Local Settings folder, that is because the folder is hidden. Just copy the address above, change “Kelwin” to your Username and paste it into the address bar. Open Internet Explorer. On the menu bar, click Tools and then select Internet Options. On the General tab, click the Settings button under the Browsing History section. Adjust the Disk space to use amount to something lower. The recommended values are between 50 to 250MB. Open up My Computer. Right click on the drive that you want to free up space, and select Properties. 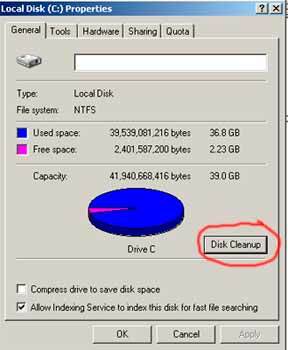 Click on the Disk cleanup button. After a couple of minutes, you will be shown a list of options where you can take in order to free up hard disk space. The options range from deleting files to compressing old files. From the screenshot above, you can see that I am able to free up 11GB if I were to select all the listed files to delete/compress. Up to 7GB can be freed if I were to compress old files. That is a lot of space indeed! Paging file is an area on your hard disk where Windows uses it as if it were a RAM. Usually, this paging file is located in your C drive and can take up to 1 or more GB. It is ideal to place this file in the C drive instead of other drives because it is faster to access it from C. Having said that, this is not a recommended step but it works. Right click on My Computer and select Properties. Select the Advanced tab and click on the Settings button under the Performance area. Select the Advanced tab and click on the Change button. The list will display all the drives on your computer and any paging file associated to it. Copy whatever setting on the C drive to the next drive. Click the Set button. Once that is done, select the C drive and click on the No paging file radio button. Click the Set button. Apply the changes by clicking the OK button on all opened windows. Bear in mind that even though you are able to install new software into the other partition(s), there are some files that are required to be installed into the C drive. A Windows installation would have taken up a few GB of space. Any common shared files will also be installed into the C drive. Any files kept in the My Documents, My Pictures, My Music and even on the desktop(!) will be stored in the same partition. As a general guide, it is advisable to allocate at least 40 to 60% of your hard disk space for your C drive. You can use the remainder to install new programs, store files or even backup important documents in case you need to reformat your windows drive. I hope this post has helped you recover some hard disk space. If you find it useful, kindly spread it along. Thank you. does the compress old files in disk cleanup contains any useful data????????? deleteing this file is harmful for my laptop?????????? Excellent advice – by just using tips 2, 3 & 4 I dropped my C drive from 24 GB to 21 GB. That’s a great improvement. Thanks for your assistance. Very good advice,my disk space doubled! Very useful info for anyone still using XP. Thanks.